(CelebrityAccess News Service) – Apple has sold over two million iPods since its introduction, solidifying its position as the number one digital music player in the world. Apple has also made available a new 15GB model offering customers 50 percent more storage for just $299. All iPods work seamlessly with the iTunes digital music jukebox software and the pioneering iTunes Music Store, which has sold over 30 million songs, providing music fans with the best digital music experience on either a Mac or Windows computer. "With over two million sold, iPod is unquestionably the leading digital music player in the world," said Steve Jobs, Apple's CEO. 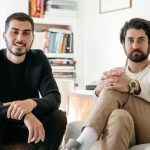 "By enabling music lovers to carry their entire music library with them at all times, iPod is clearly changing the way we enjoy our music, much the way the Sony Walkman did decades ago." iPod and the new iPod mini are the only portable music players with Apple's patent pending Auto-Sync, an innovative feature that automatically downloads an entire digital music library onto iPod and keeps it up-to-date whenever iPod is plugged into a Mac or Windows computer using FireWire or USB 2.0. The ultra-portable iPod is designed with a solid-state "no moving parts" touch wheel and backlit buttons for precise, effortless navigation through thousands of songs; an elegant dock for easy syncing and charging with an audio line out for quick connection to a home stereo or powered speakers; and "On-The-Go" playlists so users can build a playlist right on their iPod. Apple's iTunes Music Store for Mac and Windows computers is the ideal companion to iPod. The iTunes Music Store makes it easy for music fans to find, purchase and download their music online. Music purchased from the iTunes Music Store is downloaded right into Apple's popular iTunes digital music jukebox software, where users can easily manage their music library, create playlists, burn custom CDs and transfer their entire music library onto their iPod for on-the-go listening anywhere. More than just music, iPod is also great for listening to and keeping track of audiobooks; as a clock and alarm; for synchronizing and managing contacts, calendars and to-do lists; as a note reader for downloaded text- based information; and for digital voice recording and photo storage with optional Belkin accessories, allowing users to record hundreds of hours of audio and store thousands of digital photos on their iPod. 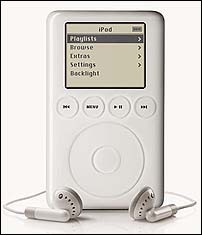 iPod includes a rechargeable lithium-ion battery for more than eight hours of continuous music. Apple's third generation, dockable iPods are now available in three ultra- portable models: a new 15GB model that holds over 3,700 songs for a suggested retail price of just $299 (US); a 20GB model that holds over 5,000 songs for a suggested retail price of $399 (US); and a 40GB model that holds over 10,000 songs for a suggested retail price of $499 (US). All iPod models include earbud headphones, an Apple iPod power adapter, a FireWire cable and a 4-pin-to-6-pin iPod FireWire adapter. 20GB and 40G iPod models also include the iPod Dock, carrying case and wired remote; these optional accessories can be ordered for 15GB iPod models through the Apple Store. Laser engraving is available for iPod for $19 (US) and can include two lines with up to 27 characters per line. iPod requires a Mac with a FireWire port and Mac OS X version 10.1.5 or later (Mac OS X v10.2 or later recommended); or a Windows PC with a FireWire or USB 2.0 port, or a Windows- certified FireWire or USB 2.0 card and Windows 2000, XP Home or Professional.